Cizrespor: Soccer and tear gas in Turkish Kurdistan. An amateur team in Turkish Kurdistan competes against a backdrop of police violence and a moribund peace process. Cizrespor’s Serkan Yilmaz (left) attempts to center the ball against Giresunspor’s defense during the first half of their Turkish Cup match. CIZRE, Turkey—Up on the apartment building’s eight-floor roof, the acrid smell of tear gas is beginning to waft—not enough to incapacitate a person’s respiratory functions, but just enough to add some spice to the proceedings. “Police shoot tear gas here for fun,” a boy of about 15 says nonchalantly from his delicate perch on a water tower. About 60 feet below, the day’s main event is underway on an overcast February morning. The local side, Cizrespor, from Turkey’s southeastern Kurdish region, is taking on second-division Giresunspor, from the Black Sea region, in a critical Turkish Cup soccer match at the club’s ground on the banks of the Tigris River. Cizrespor, which plays in the fifth tier of Turkey’s soccer system, has already exceeded all expectations by making it to the group stage of the Turkish Cup. Few expected the team to score a goal, let alone qualify for the final group of 16, but anticipation is building over the prospect that a victory over Giresunspor could propel Cizrespor into the next round and set up an epic tie with Galatasaray, an Istanbul-based team that commands a national following bordering on the religious. The eagerness to succeed is well-founded, for Cizre is no ordinary city. Situated where Syria, Turkey, and Iraq meet, Cizre is a stronghold for the Kurdish freedom movement, led by the Kurdistan Workers’ Party, or PKK, which has waged a 30-year battle for national rights and social revolution in Turkey’s predominantly Kurdish southeast. Particularly during the 1990s, successive governments tried to stamp out the insurgency with draconian measures, including summarily executing captured PKK fighters; facilitating deep-state actors to engage in extrajudicial killings; destroying villages to cut off support networks for the guerrillas; and placing severe restrictions on the use of Kurdish, an Indo-European language that shares more in common with English than Turkish, an Altaic tongue with roots in Central Asia. In turn, PKK fighters have attacked soldiers and symbols of the state; altogether, more than 40,000 people have been killed in the conflict. Like other areas of Turkey’s Kurdish region, Cizre bore the brunt of state excesses in the region, with a climate of fear pervading the town. The prospect of progression into the next round has enthralled the city, with some fans perhaps getting a little ahead of themselves. “We want to be among the best; we want to play Bayern Munich one day!” says one supporter, a long-haul truck driver named Orhan Suat. “This is the biggest match for Cizrespor in 10 years,” says Faruk, a night watchman outside the town’s ramshackle bus station. Others are more circumspect in their hopes. “We’re not going to win the cup, but it’s important to always go that one more step,” says Abdi, a shopkeeper. Hand-in-hand with the draconian security measures of the 1990s, the state also sought to provide an opiate to the masses, promoting soccer in the region by surreptitiously allocating them financial resources from the state budget. Several Kurdish clubs succeeded in reaching the country’s top division during the period—irritating many rivals who felt the clubs received the benefit of referees’ calls in the interests of national harmony. 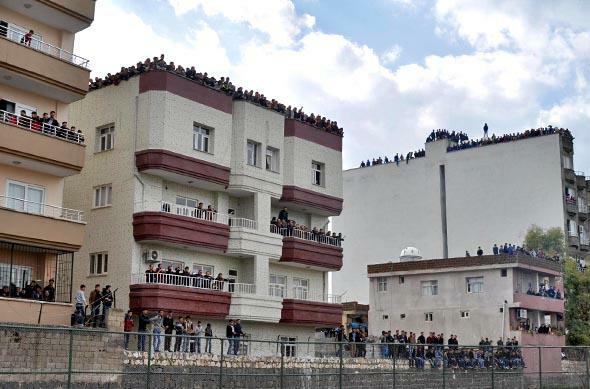 Because of a stadium ban imposed by the Turkish Football Federation, Cizrespor fans watched the match between their team and Giresunspor from the roofs of nearby buildings. The heavy state involvement, however, was overt to many in the area, and Kurds offered only wary support to clubs like Cizrespor, according to Abdurrahim Ugan, an official at the Cizre branch of the Democratic Regions Party, or DBP, a legal party that shares the same societal grassroots as the outlawed PKK. “People are starting to go again now that it’s not so associated with the state,” Ugan says over cups of black cay (tea) in his sparsely appointed office. In just a few moments a march will begin, organized by the DBP to honor a local youth who died four days previously while fighting against ISIS in Iraq’s Sinjar region. After Turkish forces captured PKK leader Abdullah Ocalan in 1999, the organization declared a temporary cease-fire, resulting in a reduction of tensions in the region; with less need to provide an “opiate to the masses,” the Turkish state ceased providing support to area soccer clubs, and today, there are no Kurdish clubs in the country’s top tier. 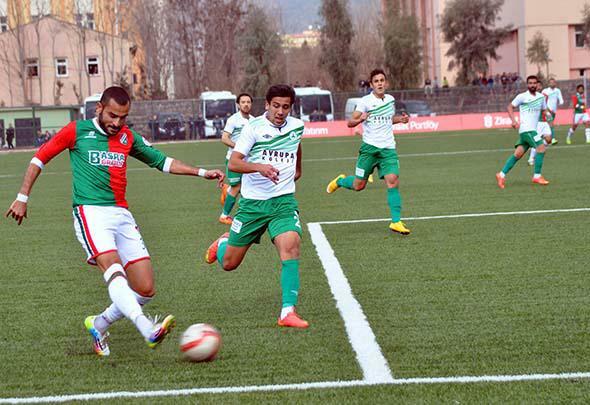 In the fourth round of the cup, third-division Amedspor, from the large city of Diyarbakir, is the only other Kurdish club in the competition. While a far cry from the 1990s, tension and violence returned to the area in the 2000s. Ostensibly recognizing the futility of continuing to seek a military solution to the issue, however, the current Justice and Development Party, or AKP, government tentatively began pursuing a peace process with the PKK at the beginning of the decade. During the 2013 celebrations of Newroz, a regional holiday marking the passage to spring that has become a forum to express Kurdish political identity, Ocalan, from prison, called for a cease-fire and a withdrawal of his fighters as a goodwill gesture. Two years on, the truce continues to hold—but only tenuously; Kurds accuse the government, and particularly the increasingly authoritarian president, Recep Tayyip Erdogan, of stalling in an effort to win a bigger electoral majority in June legislative elections. Additionally, they accuse the government, one of the leading opponents of Bashar al-Assad’s government in Syria, of abusing its goodwill by constructing a series of heavily fortified police stations throughout the southeast and of supporting ISIS in its battle against Kurdish forces in the Syrian city of Kobani. Indeed, close to 50 people were killed around Turkey between Oct. 6–8 last year when protesters took to the streets to denounce the AKP’s ostensible support for ISIS in Kobani. While street battles between security services and local youth are common in Turkey’s Kurdish region, events threatened to spiral out of control in Cizre before the match, as police were accused of randomly opening fire on children in some neighborhoods, resulting in the deaths of half a dozen youths, the youngest of whom was 12. “The police are killing our children,” says one taxi driver, gesturing to the town’s Cudi neighborhood, whose residents dug trenches at the entrances to the quarter to prevent the police’s armored vehicles—known as akrep (“scorpions”)—from infiltrating the area. While Turkey’s government initially denied accusations that police were responsible for the shooting deaths, the local bar association issued a report, noting that in one case, 14-year-old shoe-shiner Umit Kurt was deliberately targeted and killed by officers. Faced with evidence of police culpability from its own inspectors, the state was ultimately forced to recall several officers who were accused of involvement in the deadly shootings. 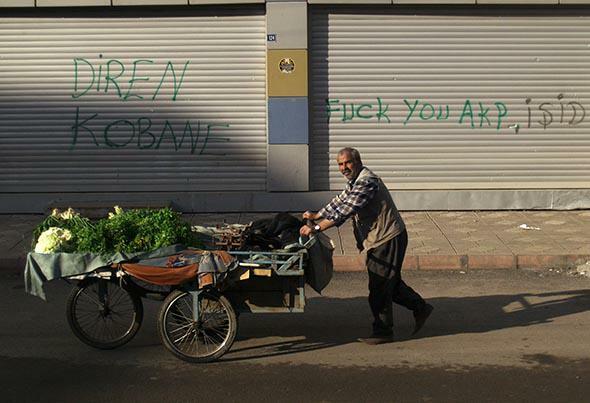 A produce salesman walks passed graffiti on Cizre’s main boulevard. Demonstrators expressed their support for fellow Kurds’ struggle in Kobane with the words “Diren Kobane” (“Resist Kobane”), as well as their contempt for the AKP, the country’s ruling party, and ISID, the Turkish acronym for ISIS. No one has been charged so far in the killings. 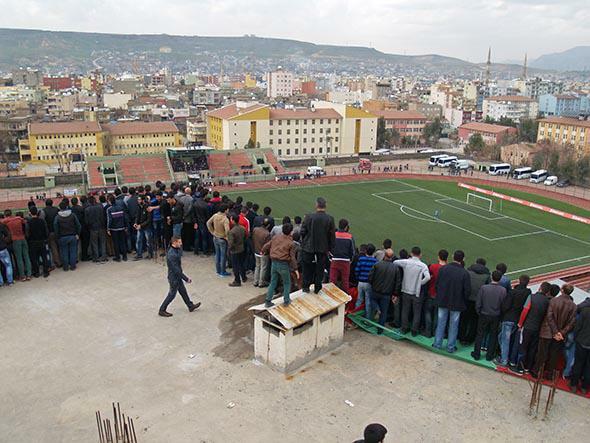 Against such a backdrop, Cizre’s amateurs prepared to face their Black Sea rivals—themselves no great power, but still three tiers above them in the league. Even in soccer, however, supporters lament interference from the long arm of the state. “We got this far [in the cup], and then the police provoked incidents so that there would be stadium bans,” Suat says, referring to punishments that would deprive the club of revenue through ticket sales and bar all supporters from attending the match in person. Indeed, while many in Cizre welcomed the ostensible normalcy that returned to the streets following the recall of officers involved in the shootings, many see the security forces’ constant use of tear gas as an effort to invite an angry response from the populace in order to justify greater police action. Apart from battles with the police, supporters had previously raised the ire of Turkey’s soccer authorities by singing the “Herne Pes” (“Forward”), a Kurdish revolutionary song that calls for Kurds to rally behind the red flag of socialism. Undeterred by the police’s alleged attempt to spoil their parade, Cizrespor supporters ignore the legions of akreps and water cannons encircling the soccer ground to head for improvised tribunes—the roofs of surrounding apartment blocks. Ahead of kickoff, upward of 3,000 supporters have grabbed precarious perches atop roofs, walls, and water depots to catch glimpses of the pitch below. Men stand two- to three-deep on the eighth floor of an apartment building in an effort to watch the action down below. While roaring on encouragement to their red and green–clad side, the home supporters also extend an olive branch to their opponents, chanting for the “Brotherhood of Peoples” in honor of their rivals from Giresun—a noted bastion of anti-Kurdish sentiment. In the next moment, though, they promptly jeer the Turkish national anthem, perhaps in the comfort of knowing that it is impossible to impose an additional stadium ban when everyone is more than content to watch the action from atop high buildings. As in many big games, the match action failed to live up to the anticipation; befitting an amateur side, Cizrespor lacked a killer instinct in front of the goal in what ultimately turned out to be a 0–0 draw. While upset at the failure to find the net against Giresunspor, those descending the staircases of the apartment buildings maintain guarded optimism that the biggest team in the group, Genclerbirligi, will dispatch Konyaspor in the group’s last match and permit Cizrespor its dream matchup against Galatasaray. Almost predictably, however, Genclerbirligi play out a turgid, 0–0 draw with Konya. “When it’s Cizrespor, they don’t try,” Suat says, watching with exasperation as Genclerbirligi aimlessly knocks the ball around in injury time, rather than seek a winner against Konyaspor. Cizrespor’s fairy tale ended early, but the club’s brief run provided an opportunity for the city of Cizre to be associated with something other than violence and death.